First, let’s talk about my sense of direction. Or lack thereof. I am not one of those people with a strong internal compass. Fortunately, Disneyland happens to be located with the front and back of the parks pretty much on a straight North-South axis. How convenient for me. And rather than add a map of the park, I’m just going to point you to the official one. To orient you, the Main Gate is on the South side of the park. Main Street goes due North (more or less) ending in the Plaza ending at the castle. I will tend to give my directions based on the Plaza facing the castle. 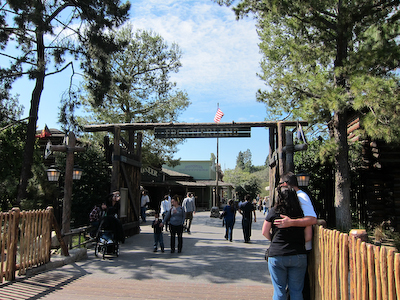 Which is all just elaborate set up to say that today I’m going to talk about Frontierland, particularly one side at the entrance to Frontierland. From the Plaza facing the castle, Frontierland is on the left, and I’ll be talking about the right-hand side, so basically the North side. Oh my god Shelby, can we just GET to the interesting part already??? 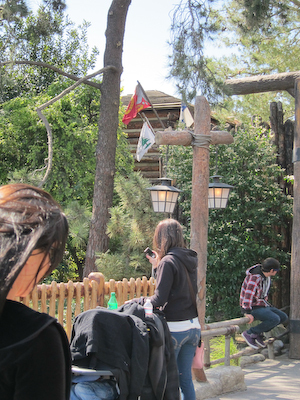 The entrance to Frontierland is meant to look like a fort. Welcome to Frontierland! Here there be cowboys. 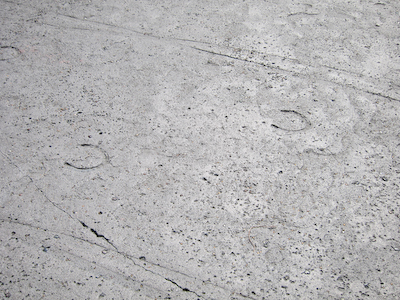 Frontierland has a nice little touch on the ground–horseshoe and wagon marks in the concrete. Theo found this endlessly fascinating. The first thing you come across is an informational sign on the door of the fort. For those lacking in acute visual skills, I’ll provide the text at the end of this post. Suffice to say it’s about the flags of the Revolutionary War, and supposedly all 13 of them fly above the fort. I was honestly only able to find, like, four. There’s a different informational plaque on the other door into Frontierland, which I suppose I will talk about when I review the South side. Once inside the gates, the first thing you come across is a pin store. 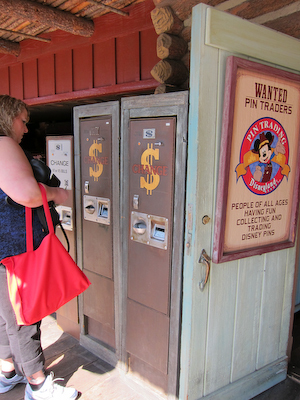 Pin trading is really big at all of the Disney parks. I’m just going to have to make a whole separate post for pin trading. Let’s just leave it at there’s a pin store. Also, there are barrels outside so guests can do their own trading. Which I will cover later. Sometime. 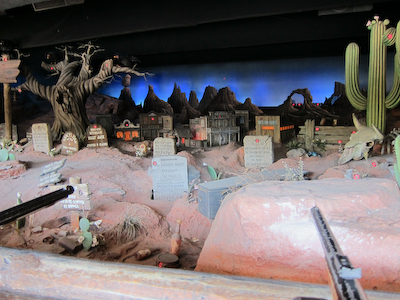 Past the pin store, there’s the shooting gallery, or the Frontierland Shootin’ Exposition. Disneyland really lacks in arcade-style games and there are only a handful. The Shootin’ Exposition is one of them. 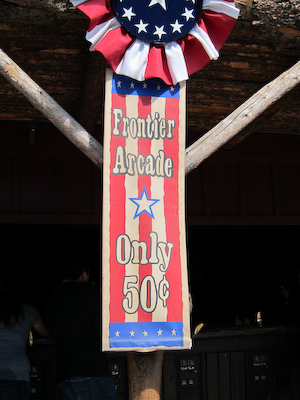 It only costs 50 cents too, which quite frankly is seriously cheap for Disneyland. 50 cents??? Yee-haw! I'm gonna shoot me some miniature fake tombstones! And if you’re worried that you’re just throwing away your money on the guns (as opposed to generally throwing away your money in Disneyland), Disney does their best to help you be successful. You know, it just occurred to me right this very second (I think as I type) that I have never actually paid the money to shoot these rifles, and I didn’t do it this time either. I’d like to say it was because I didn’t want to leave Theo stranded in his stroller while I went on a shooting spree, but it’s actually just because I didn’t think about it. Hey, I never claimed to be, like, thorough and organized, okay? Anyway, if you don’t have a couple of quarters on you, you can use those old-fashioned change machines you never see these days anymore. Disney aims for authenticity. If there were change machines in the Old West, this is probably what they would have looked like. Like any shooting gallery, you aim at your standard Wild West scene. This one has large tombstones in the foreground and small houses in the back. I know that’s to visually create a sense of depth, but honestly it just kind of looks like the tombstones are freakishly large in proportion to the rest of this little town. And the rifles to indeed appear to be straight. 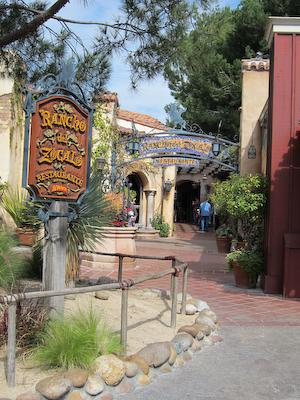 And then once you leave the shooting gallery, you get to the Rancho del Zocalo restaurant. This is (shockingly) a Mexican restaurant and is Kevin’s favorite restaurant in the park. The entrance is kind of tucked away and there are tables inside and outside. It’s a pretty good place to eat. 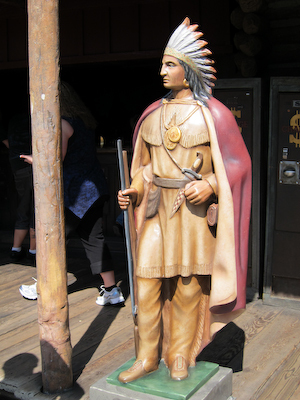 After that you are on your way to Big Thunder Mountain Railroad, which is another post. 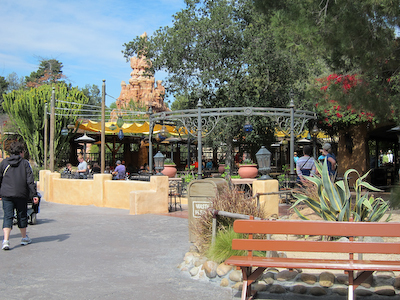 And that’s pretty much what you see on the North(ish) side of the entrance to Frontierland! 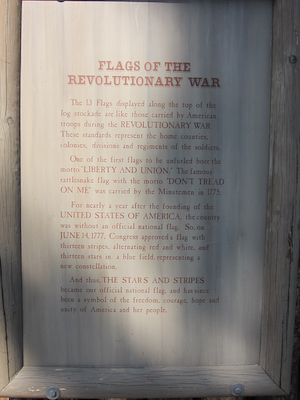 The 13 Flags displayed along the top of the log stockade are like those carried by American troops in the REVOLUTIONARY WAR. These standards represent the home counties, colonies, divisions and regiments of the soldiers. One of the first flags to be unfurled bore the motto “LIBERTY AND UNION.” The famous rattlesnake flag with the motto “DON’T TREAD ON ME” was carried by the Minutemen in 1775. For nearly a year after the founding of the UNITED STATES OF AMERICA, the country was without an official national flag. So on JUNE 14, 1777, Congress approved a flag with thirteen stripes, alternating red and white, and thirteen stars in a blue field, representing a new constellation. And thus, the STARS AND STRIPES became our official national flag, and has since been a symbol of freedom, courage, hope and unity of America and her people. 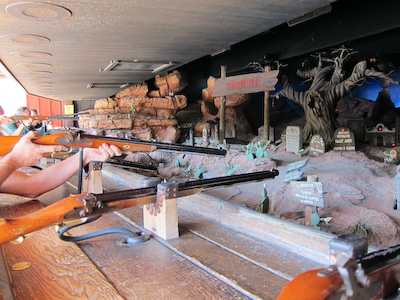 The shooting gallery is my dad and brothers’ favorite thing to do at Disneyland. No joke. 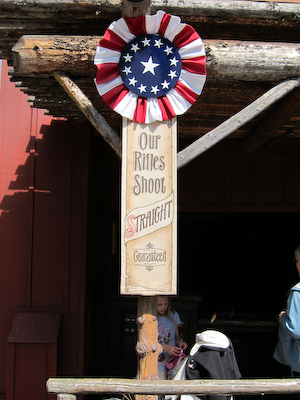 Whenever we go to Disneyland as a family, we stroll down Main Street, veer right into Frontierland, and before I know it, the three of them are loading quarters into toy guns like ammunition. When not cheering them on, I tend to use this special, family-bonding time to pick up Fast Passes for Big Thunder Mountain, get skewers from Bengal BBQ around the corner in Adventureland, or peruse the millinery across the street. I really love hats.